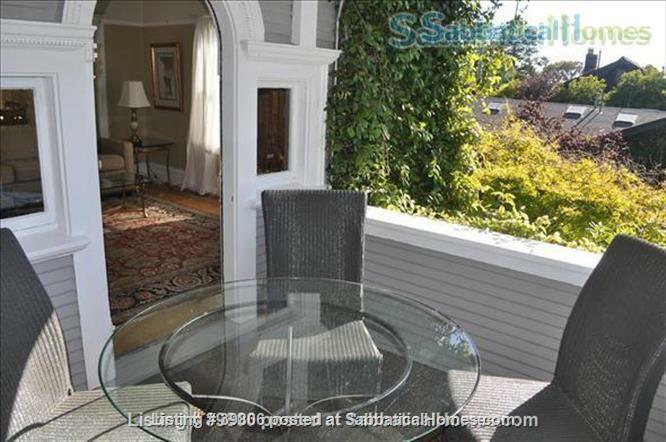 Large Edwardian located 8 blocks from University of California, Berkeley, two blocks from College Avenue. Quiet Elmwood neighborhood. A short walk, bike or bus ride along eight tree-lined blocks will take you the south side of the UC Berkeley campus from this Elmwood property. A 1908 historic Edwardian in Berkeley's sought-after Elmwood district, this turn-of-the-century period residence has original architectural detail, 9' ceilings, hardwood floors, pocket-doors, many windows and lots of light. Located in one of Berkeley's coveted neighborhoods called 'the Elmwood,' this home is situated in a quite residential neighborhood, in a cul-de-sac with no through-traffic, and only three blocks from College Avenue. Equidistant to Telegraph and College Avenues, the property is just a couple of short blocks to fine dining, ethnic restaurants, bookstores, theater, and Berkeley's university campus, (Cal). San Francisco is about a 20-minute drive without traffic and easily accessible from Rockridge BART which is 10 blocks south of property on College Ave. The property is on one level, on the ground floor, faces west and south, and is comprised of three bedrooms and one bathroom, large expansive dining and living rooms, with original built-ins, 9 foot ceilings, and an entry foyer between living rooms, separated with pocket doors. There is a full laundry room, leading to a private fenced-in patio outside. There is a queen bed in each of two bedrooms and a high-end double sized sofa-sleeper with steel base and TempurPedic mattress in the third bedroom. A full-sized new washer and a dryer are included in the laundry room off kitchen. Furnished and ready to move into with all bedding, towels etc., and a fully-equipped kitchen. Strawberry Canyon Recreation Center and outdoor lap and toddler pools are five minutes away, as is the Berkeley Tennis Club and the Claremont Resort and Spa. There are two children’s parks within a half block of the property: Bateman Park and a second park set is in a quiet redwood grove and green field along with new play structures and sand for kids. Walk, bike or drive to campus! Quiet and away from it all in a secluded location, yet just a couple of blocks to everything. Ideal for visiting faculty family, sabbatical visitors, or a responsible, quiet group of students. Available by the month or longer. Prefer 1-6 mos min. Originally from England and Ireland, and living in SF bay area more than 20 years. Student at UC Berkeley.